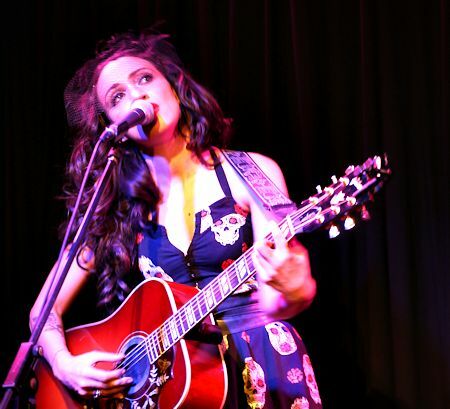 This was Lindi Ortega's second tour of Australia – she cruised through earlier in the year and performed two shows, one in Sydney and the other in Melbourne . 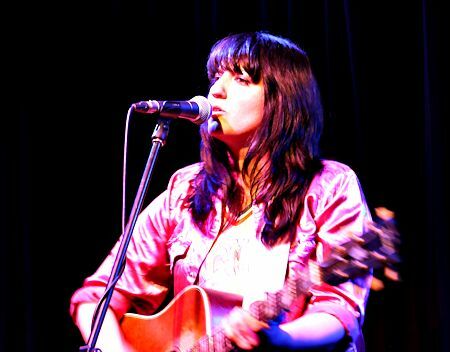 She was invited back to be part of Love Police's mini Americana music festival Out On The Weekend which took place last Saturday in Melbourne and will also take in Brisbane next weekend with a slight variation of artists. Descended from Irish Mexican roots, it is no wonder that the musical tastes of Lindi Ortega defy description and cannot be classified into one cosy genre; she can rock, she can croon, she can sing country, she can sing blues, gospel, you name it. And she has one of those effortlessly beautiful voices that tugs on the heartstrings as soon as she opens her mouth. For those of us who didn't make it to Love Police's Out On The Weekend music festival, it is fortunate that several of the star International acts were performing side shows. Such was the case with Lindi Ortega. I must admit that prior to last week, she had not crossed my radar, so after being offered tickets to see her live at the Toff, I set about familiarising myself with her work by listening to her two latest albums – Cigarettes & Truckstops and Tin Star and also watching her quirky self made videos on You Tube. I was hooked in no time! The Toff In Town is a cosy venue in the city on the second floor of Curtin House , and once you get past the noisy Choo Choo Bar and enter the band room, the atmosphere changes from raucous modern pap to soothing roots music, with a pleasant selection of Americana songs being played through the sound desk. The show opened with two short sets from the quality support acts, firstly Tracy McNeil , who I have had the pleasure of seeing live several times. Tracy is originally from Canada so she expressed her delight at opening for fellow countrywoman, Lindi Ortega, and performed seven songs, mostly drawn from her latest album Nobody Ever Leaves , including City Lights, Swinging, Last Place I Looked and older songs like Queen of the Night. 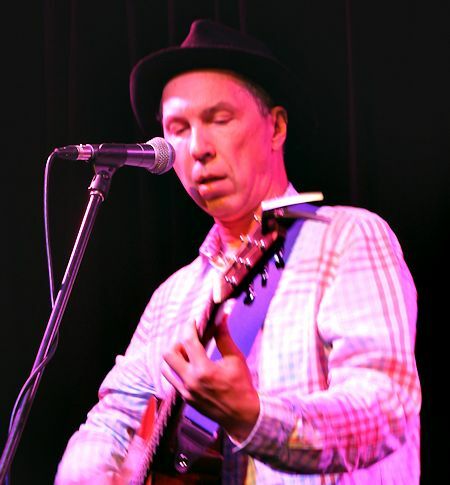 Rob Snarski , long time member of The Blackeyed Susans band, was next to step onto the stage and performed a passionate half hour set with songs from his debut solo album Wounded Bird. He is a riveting performer with a powerful affecting voice, and dramatic guitar accompaniments. The song that really grabbed me was his band favourite It Starts With Snow , but the Ennio Morricone inspired The Black Caress and Christmas song Christmas Card From A Drunken Sailor were also memorable. 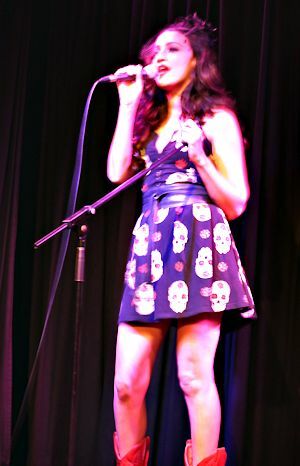 It was about 9.30pm when the star act Lindi Ortega took the stage. For this tour she was accompanied by ace guitarist Champagne James Robertson and he started the show with the opening chords to Waitin' On My Luck To Change before Lindi bounced onto the stage to rapturous applause to sing the song. A real change of mood and vibe, the next song was Lindi's spine tingling cover of the Aretha Franklin classic I Ain't Never Loved A Man, Lindi roaming the stage with mike in hand. She picked up her guitar for the next number, remarking that its name was Frankie after Frankenstein, and expatiated on her love for the macabre. She launched into the spaghetti western flavoured rocker Hard As This, the opening track on her latest album Tin Star. The lyrics are undeniably macabre but the tenderness with which Lindi Ortega sings this song negates all the creepiness and makes it sad and beautiful. Her penchant for the darker side of life extends to how she dresses for her shows. She wore a dress printed with skulls and an old fashioned net draped over her forehead, her dark curls tumbling around her shoulders. And of course she wore her signature little red boots. Continuing the supernatural theme the next song was Wicked Witch , but that was followed by the gospel sounding Faded Gloryville and a cover of Hank Williams' I'm So Lonesome I Could Cry . As a segue into All My Friends, wherein she details all the various types of artificial props that make life liveable for some, she called for whiskey. This was promptly delivered and downed in one draught – she's a wild girl. You certainly couldn't accuse Lindi Ortega of playing the same type of music over and over again. There were dulcet folksy ballads, country heartbreakers, spaghetti western stompers; in fact a whole plethora of different types of music make up Lindi's repertoire, so it's no wonder she has been nicknamed “Indie Lindi” – she marches to the beat of her own drum. She closed her set with the comic The Day You Die , in which the narrator describes how all the professions of love – till the cows come home/till the trains don't run –force the beloved to ensure these things won't happen, in the fervent hope that he won't say I'll love you till the day I die. With an impish wink, she departed the stage, but returned soon after to perform a two song encore, the first being a cover of the Johnny Cash classic Ring of Fire , then by prior request, the title track of her album Cigarettes And Truckstops . Hers is a lively, dramatic and highly enjoyable act, and she was admirably supported by the amazing guitar playing of Champagne James Robertson, who can draw the most remarkable sounds from his Fender electric guitar and had no trouble handling any of the diverse musical moods of Lindi Ortega's songs.